There were 10 final posters, of which the final four went to a public vote. 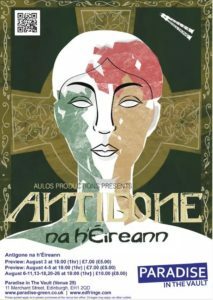 The runaway winner of our poll was Antigone na h’Éireann’s beautiful poster that took the celtic cross and green, white and red colours of the Irish tricolour and made a stunning poster that was both visually appealing and reflected the play’s themes of family and faith and a woman’s journey to bring her family the honour they have long sought. 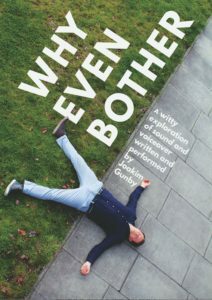 A well-deserved win for the Aulos production team! The poster for ‘Stardust’ took an early lead but sadly could not sustain it. 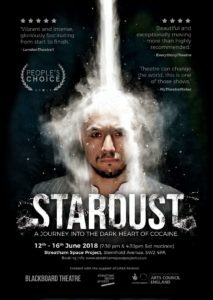 The cinematic look of the poster captured the play’s tense drama well, and the illuminated white dust falling on the lead’s head was inspired. A worthy silver placing! John’s poster was striking and unusual. 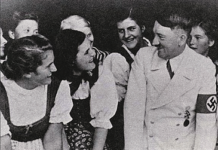 His face realistically etched onto the mannequin was both familiar and unnerving. 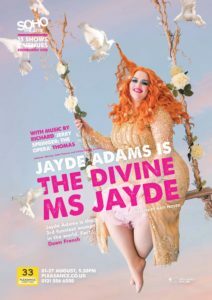 I am surprised this poster did not do better as it has a real stand-out quality and is a poster for a comedian with legions of followers. It’s divine imagery perfectly encapsulates the show. Better luck next year Jayde! 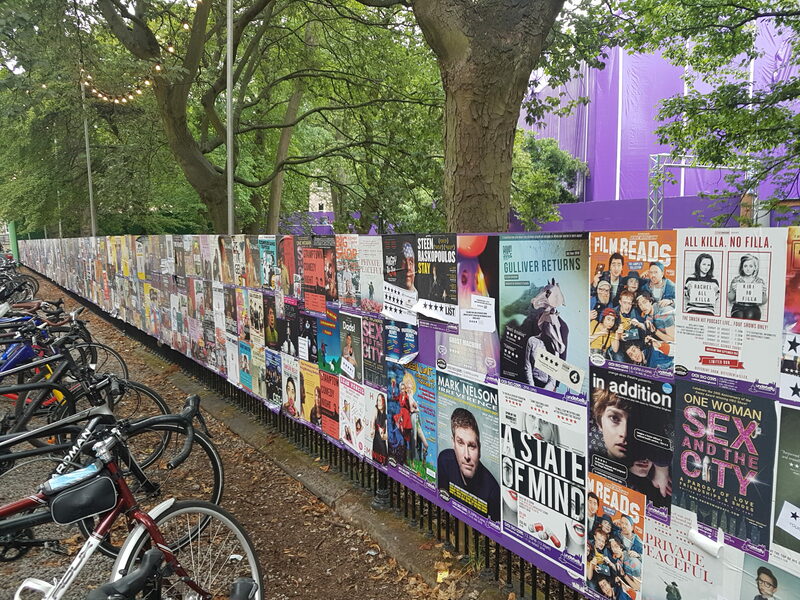 The posters from fifth to tenth place were ranked by TheEdinburghFringe.Com’s judging panel. This poster was just one vote off making the final four and the public vote. Which is a real shame because I love the simplicity of the design. 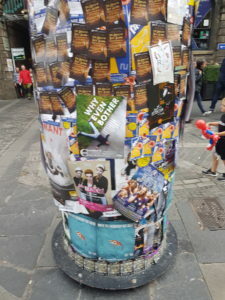 The poster really stood out on the Royal Mile and branded the show perfectly. ‘Why even bother’ with fancy graphics and artwork if simplicity looks this good! 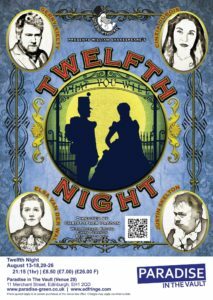 This stunning poster was used for Some Kind of Theatre’s Twelfth Night. 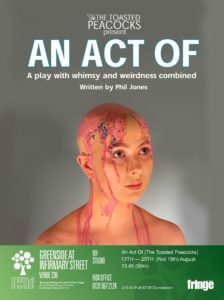 Unfortunately, and very surprisingly for a theatre company that had produced such terrific art work for its poster, it was not used on the Fringe website which had a bland silhouette. Still the poster perfectly captures the Victorian era and is a beauty to behold. 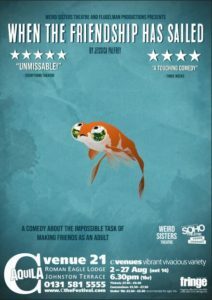 There was something very endearing about this poster. A little goldfish with lovely sad eyes that enticed everyone passing by into the blue poster tank where the lonely little fish resided. 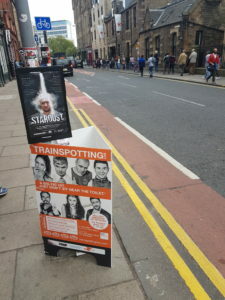 And kudos to the marketing team because this poster was everywhere around Edinburgh! 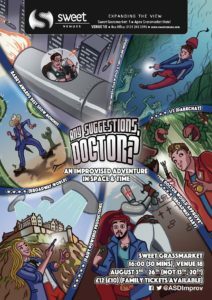 This entry is not an obvious choice for the competition but the poster is a superb example of comic graphic art and really mirrors the fun and adventure of the show. This poster intrigued many. 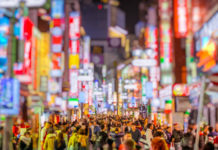 An Act of…? Pink goo on head? And like ‘Why Even Bother?’ and ‘When the Friendship has Sailed’, the Toasted Peacocks must have put a lot of leg work in running up and down the streets of Edinburgh over the three weeks, as this was again a very visible poster. 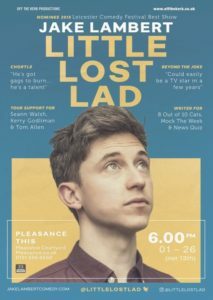 The unusual colour scheme really worked on this poster and again the visual effect of Jake looking wide-eyed and upwards really linked up with show’s central theme. Every time we saw the poster, we just wanted to reach out and ask ‘you alright love?’ and take him to McDonalds for a milkshake! Here are a couple of the winning posters in situ. Hopefully you will agree they really stood out and delivered on raising interest in the shows they were advertising. 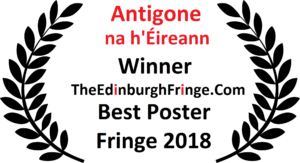 Well done again to Antigone and to all our top 10 finalists; to the posters designers and the marketing teams who spent hours putting them all up across town. We certainly enjoyed seeing al, the posters around Edinburgh this Fringe, and look forward to more inspirational designs for Fringe 2019!